You are currently browsing the tag archive for the ‘sick’ tag. Who seriously likes feeling run down or under the weather? I am not one that person. I guess its due to my daily ‘hurry up and wait’ to ‘go, go, go!’ lifestyle that I’ve become accustomed to that has helped land me in this position. Too much ‘go, go, go!’ and not enough down time if you ask me. I will admit the one bonus to being this sick is not having to do the rest of the stuff that I already did do as part of my day and getting to vege on the couch. I even managed to watch a movie! The Vow – great movie, based on a true story to boot. Warmed my heart despite having to rewind often and watch in 15-20 min chunks. Good thing it was on the PVR. I’m sure the book is a million times better as I find a lot of small details get lost in translation when being made into a Hollywood movie. Not much else happened this week. I managed to get the darling hubster in to see my family doctor and he is now a patient – there’s a shortage of family doctors accepting new patients around here in case you’re wondering. The day after he was registered, he caught my allergy-cold/cold-flu thing. Fortunately for him, his body is able to process it much quicker then mine. Within 36 hours, he’s gone through everything I have in the past 5 days and counting. How is that fair?! This was a short week since Monday was a holiday (Labour Day) thus resulting in me trying to catch up on laundry (travel laundry no less) and other necessary chores around the house in between naps. 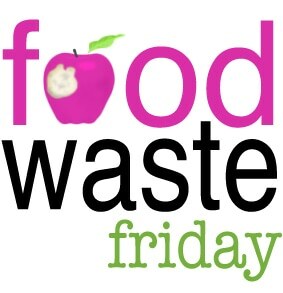 I’m proud to announce that this is our second Friday in a row without food waste!! 🙂 With Monday being a holiday (Labour Day) helped to keep in mind that we had to use up x, y & z before leaving as well as being conscious to not ‘over buy’ at the grocery store upon our return. To be honest, I actually kinda like the bare fridge look. I mean when I’ve browsed blogs and they’ve shown how organized their fridges were, it kinda make me wonder where their food was and what they actually ate. Now…with gaps between jars/containers and bare shelves showing – I still see full meals that can be made up with what few items we do have in there. Odd huh? Anyhow, I’ll chalk this week up to a success! Plus being sick as a dog and not wanting to go grocery shopping really helped me to only pick up the ‘necessities’. Again, another eye opening experience for me. So how did you fare this week? What did you end up tossing? On Friday’s, I share what food items that I have ‘wasted’ by letting spoil during the week from forgetfulness and/or neglect. Kristen over at The Frugal Girl has inspired me to publicly post in hopes of reducing waste.